One of the very first visuals you are treated to when watching the original Star Wars movie is Darth Vader ominously strolling down the white hallway of the rebel cruiser in his cold, black suit of armor. It’s a chilling scene and makes you ready for more! But have you ever stopped to wonder how long it takes Vader to strap all of that armor on in the morning? Even if he’s got a whole automated system set up to put his suit on for him, like the one that lowers his helmet onto his head, it has to be a tedious process. 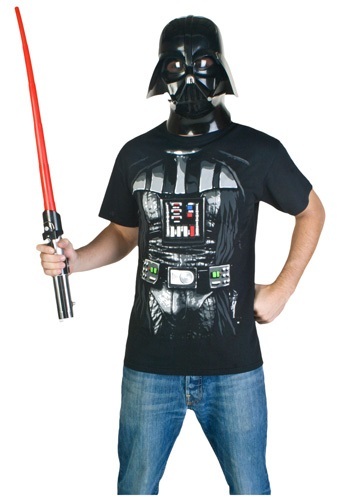 Now you can enjoy the feeling of dark power you get from looking the Lord of the Sith without all the hassle in this Darth Vader Costume T-Shirt! This officially licensed Star Wars shirt is printed with Darth Vader’s famous armor on the front. The control panels may not feature working switches and indicators, but they won’t take all morning to put on either, so you can spend your precious time locating stolen plans and hidden bases!